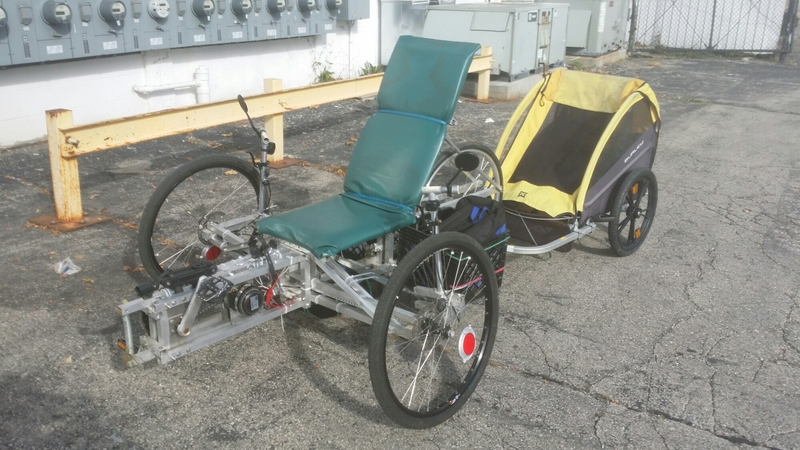 Custom Processing Unlimited is proud to offer custom recumbent tricycle building as a service! Based on a fairly simplistic base design, these tricycles are extremely modular for personal builds. With a wheel base (width) of up to 5 feet and a length of up to 15 feet, options are VERY vast. Up to 3 seats with plenty of possible storage space (baskets, side saddles and more)! These tricycles are “tadpole” style, which means that they have two (2) wheels in front and one in the back. Also includes option for various speeds of electric motors. Height, width, length, wheel sizes, seat angle… EVERYTHING is customizable! Built from aluminum square tubing, custom milled aluminum parts, custom built wheels and all bolted together! Feel free to email or call for more details or to make a custom order!